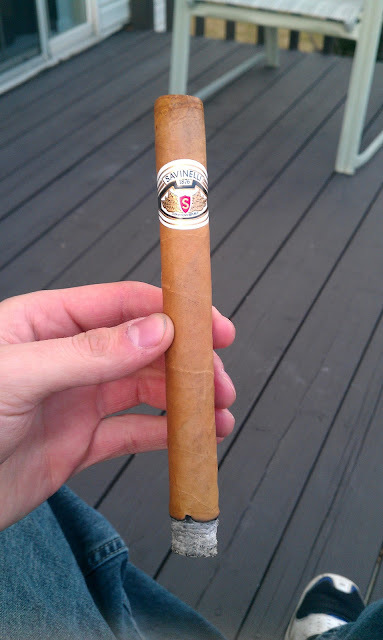 Appearance (0-20): This cigar sports a beautiful light brown wrapper. Just by appearance, it looks like a light, creamy smoke. The wrapper upon inspection has some small color variations, but this is clearly much more prominent in Connecticut wrapper. The band is simple, as many Savinelli’s, but it doesn’t have a cheap look to it. Construction (0-20): Great construction is a common theme here for Savinelli. There was one larger being near the cap of the cigar, but the burn was unaffected. The burn was even, requiring no touch ups, and cool right down to the finish. The ash was a nice white-gray shade, and held on for about 1.25”. The draw was perfect, and impressive for the Churchill size. Strength (0-20): Listed as mild-medium, it was somewhere on the lower end of that. Personally, there was no nicotine kick during any of the cigar. That is actually a good thing, as a mild cigar should be a “sit back and enjoy” cigar. This fit the bill, and I would rate it a solid mild smoke. The real point of interest in this smoke is the flavor profile. Flavor (0-20): This was something that really surprised me. Appearance means everything when choosing a cigar, and I stereotyped this as somewhat bland. WRONG! The flavoring was superb. From the initial light until about halfway, the cigar is very creamy with hints of cedar and sweetness. The creaminess will continue as you smoke down to the nub, but the second half picks up a bit and give a very nice spice profile. This cigar is well balanced in terms of flavoring, and quite enjoyable. Value (0-20): For $8.00, I would definitely spring for another one. The pricing is done with when pairing this to the size of the stick. I’ve heard this is somewhat comparable to an Opus X. I’ve to smoke one (I will be shortly), and it is less than half the price. If there are many similarities, then this will be the easy choice due to its value. I will report back soon. Additional Notes: Smoked on my deck with Sweet Tea. Overall (0-100): I was very pleased with this smoke from start to finish. I almost never smoke lighter cigars, with the Connecticut shade wrapper. With that being said, I will be smoking them now. For whatever reason, I was turned off by lighter cigars. This really opened my eyes up again to the broad spectrum of smokes. Savinelli, you have done it again! You are quickly becoming one of my favorite smokes on the market. Thanks! Nice review. I have a few ELRs sitting in my humi waiting for the 6 month mark so I can review it then myself. I have yet to have a better $8 smoke though, and that's a fact! Cheers.